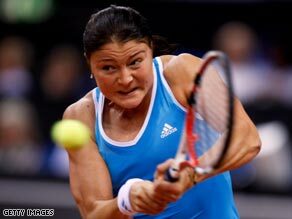 (CNN) -- World number one Dinara Safina had to come from a set down to beat Flavia Pennetta of Italy 3-6 7-5 6-0 on Saturday to set up a final showdown against fellow Russian Svetlana Kuznetsova at the WTA tournament in Stuttgart. Safina strikes a typical pose as she powers a return in Stuttgart. Kuznetsova beat compatriot and Olympic champion Elena Dementieva 6-4 6-2 in the first semifinal at the indoor clay court tournament. But Safina, newly installed at the top of the global rankings, had a tougher fight against an unseeded opponent as she bids to confirm her status with a tournament win. Pennetta took the first set and worked her way into a 3-1 and then 5-4 lead in the second before Safina held service and broke for a 6-5 lead. She wrapped up the set then swept through the decider without dropping a game to reach her third final of the year. She was beaten in the final in Sydney by Dementieva and the Australian Open by Serena Williams. Fifth seed Kuznetsova edged ahead from 3-3 in the first set and took a 3-0 lead in the second on the way to a comfortable victory. In the WTA tournament in Morocco, top seed Anabel Medina Garrigues of Spain triumphed in Saturday's final as she beat Ekaterina Makarova of Russia 6-0, 6-1. Medina Garrigues went one better than last year when she lost to Argentina's Gisela Dulko in Fez. It was her third career title, all on clay, on the WTA Tour.